ScaleOut’s in-memory computing technology adds key capabilities for e-commerce with fast, scalable session tracking, multi-site disaster recovery, and now real-time, targeted recommendations for shoppers. ScaleOut Software has been delivering the industry’s fastest, easiest to use session-state storage for more than a decade. ScaleOut’s in-memory computing opens the door to operational intelligence for e-commerce. ScaleOut’s in-memory data grid offers the industry’s fastest, easiest to use session-state storage and has been deployed on leading e-commerce sites worldwide. Incorporating transparent support for both Windows ASP.NET and Java J2EE with optional APIs for extending functionality and maximizing performance, ScaleOut SessionServer and ScaleOut StateServer have become the trusted session-state solution for hundreds of e-commerce companies. Every minute of downtime can cost e-commerce sites thousands of dollars in lost sales. That’s why leading e-commerce companies host server farms at multiple sites tied together by a global load-balancer; if one site goes offline for any reason, other sites automatically pick up the load and keep customers connected. ScaleOut GeoServer seamlessly fits into this strategy, replicating session-state to remote sites so that they are always ready for customer requests — with in-memory data storage that deploys fast and scales on demand. Targeted recommendations have proven to be highly effective for cross-selling and upselling on e-commerce websites. However, conventional approaches have been been limited to static, pre-computed recommendations and/or real-time recommendations targeted to groups of users (for example, suggesting products similar to the ones being browsed). Neither approach takes into account a shopper’s buying history to make personalized recommendations. With the in-memory computing technology in ScaleOut ComputeServer, that all changes. Now, e-commerce sites can instantly combine each customer’s individual shopping history and preferences with current browsing activity to generate highly relevant, personalized recommendations. In-memory computing gives e-commerce sites operational intelligence. Experience operational intelligence in e-commerce. Here’s how ScaleOut ComputeServer enables operational intelligence for e-commerce. As illustrated in the following diagram, ScaleOut’s in-memory data grid captures incoming click-streams from e-commerce customers with very low latency, tracking each customer’s browsing behavior. 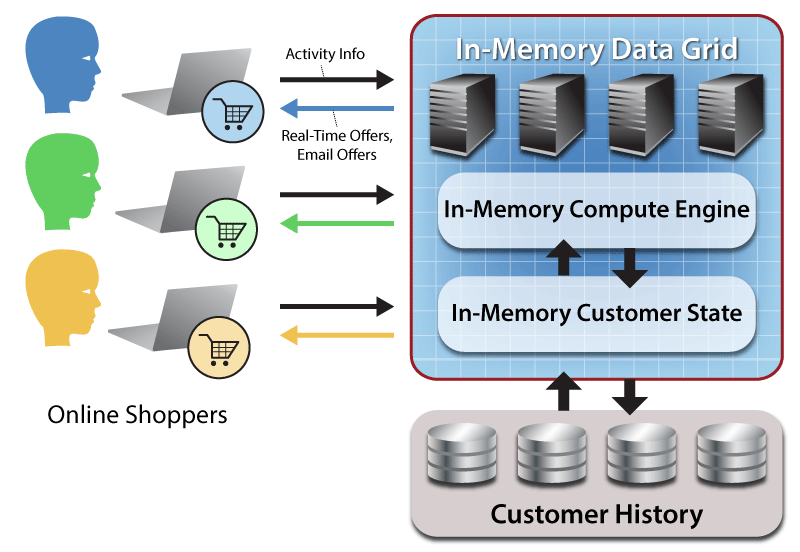 The integrated in-memory compute engine enriches this real-time data with historical information describing the customer’s shopping history and preferences (such as preferred brands and sizes), and it can combine all of this information to make instant recommendations tailored to the needs of specific customers. Operational intelligence gives each customer an intelligent, “personal assistant” to dramatically enhance the shopping experience. Only in-memory computing technology specifically designed for deployment in live, mission-critical systems can provide operational intelligence for e-commerce sites. Its combination of fast data access, scalable and highly available in-memory storage, and integrated compute engine make ScaleOut ComputeServer an ideal platform for hosting the business logic required to generate real-time, personalized recommendations. Prepare for a transformation in e-commerce shopping.